Tweet us at @CMIContent for speaker suggestions or topic ideas for upcoming chats. We would love to know what interests you and who inspires you! 11/20/2018: No #CMWorld Twitter Chat today. 09/04/2018: No Chat Today – follow the #CMWorld hashtag all week while we are at Content Marketing World! 9/5/2017: No Chat Today – follow the #CMWorld hashtag all week while we are at Content Marketing World! 09/06/16: No Chat Today – follow the #CMWorld hashtag all week while we are at Content Marketing World! 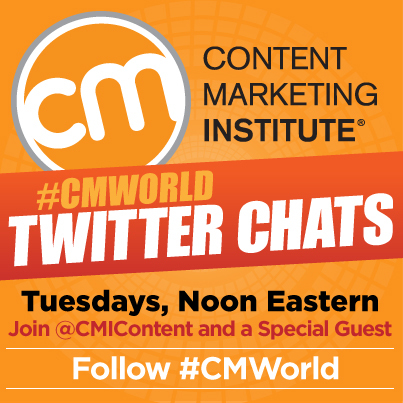 9/9/14: No Chat Today – follow the #CMWorld hashtag all week while we are at Content Marketing World!